You know the saying like father, like son?? 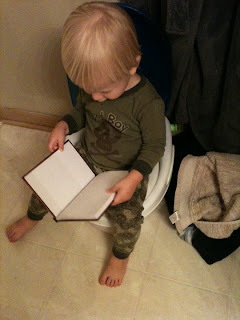 He hasn't quite grasped the idea of the potty, but he knows it's a good place to catch up on his reading!! Currently, I am knee deep in a Wordpress transfer, so expect some "fluffy" posts from me over the next week or so. Thank gawd for #blogboycottday this Friday!! Are you a bathroom reader? Or bathroom tweeter? ?